First Parish of Watertown, MA, seeks a 10-hour per week Youth Coordinator to work with our Senior Youth Group (grades 8-12). First Parish of Watertown, located just west of Boston, is a loving, warm congregation with an active children’s and youth program. Our Senior Youth members participate as teachers in church school classes and in regular youth group programming. The youth coordinator would supervise youth programming on Sundays from 10-2, and spend some time each week planning activities and helping to recruit volunteer advisors. The youth advisor would accompany youth on retreats, social justice activities, and on occasional overnight activities either as a group or with other area youth. The Youth Coordinator would also work on coordinating our OWL program in collaboration with the DRE. Because the Youth Coordinator works with high school youth, the candidate must be 25 years old or older, and must submit to a CORI (Massachusetts background check). Familiarity with Unitarian Universalism is preferred. For full job description, see below. To apply, please send a resume and cover letter to Lauren Strauss, Director of Religious Education, at dre@fpwatertown.org. The position begins on September 1 (first Sunday of work will be September 16) and we will accept applications until the position is filled. HOURS and Compensation: $7000/year Stipend for 10-12 hours a week, September – June (40 weeks). OVERVIEW: The Youth Coordinator works with volunteer advisors, the RE Committee, and the DRE to organize and oversee the Senior Youth Group, organize Junior Youth Group, and facilitate OWL programs. 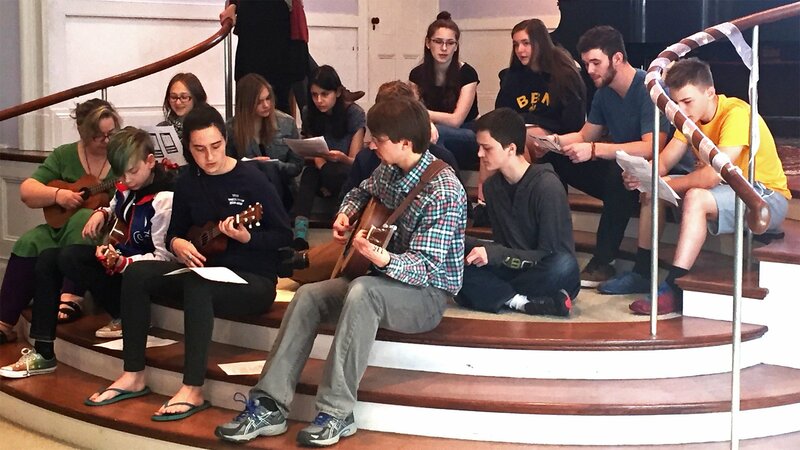 The Youth Advisor’s role is to empower youth to participate fully in the life of First Parish of Watertown and to facilitate activities that help youth develop a sense of connection and community with each other and with the larger church. Attend Senior Youth Group functions in an advisory and supervisory role. SYG meets most Sundays during the church year. Functions may also include fundraising events, social events, service projects planned by the group, and overnight youth conferences in nearby churches. Lead the youth in organizing and planning worship, social action, and fun events throughout the year, including the annual Youth Service (usually on the second Sunday of June), an annual weekend camping trip (generally occurs in June or July, depending on youth availability), at least 2-3 fundraising events, Bikes not Bombs and Charles River Cleanup. Communicate information about upcoming meetings and events with the youth, their families, and the larger church. This may include reaching out to non-attending or new youth; seeking opportunities for collaboration between youth and adults around the parish and nearby SYGs; and publicizing SYG events through the monthly newsletter or weekly Church School News, emails, etc. Coordinate and Facilitate Our Whole Lives Lifespan Sexuality Education (OWL) programming throughout the year. This includes becoming trained in both Junior-Senior OWL and Elementary OWL; working to schedule OWL sessions including facilitators, snacks, etc. ; and presenting the Parent Information sessions in collaboration with other facilitators. Other levels of OWL may be added. Other duties include coordinating youth teachers on Sunday mornings, coordinating volunteers for Junior Youth activities, attending meetings as needed. The Youth Coordinator will model Unitarian Universalist values and will encourage Youth to incorporate these values into meeting times. This may be accomplished through guiding the Youth to set goals that are consistent with church goals set by the Parish Council; through the implementation of a SYG covenant and/or mission statement; and by establishing rituals and activities that reflect our UU Principles and Purposes. The Youth Coordinator will communicate consistently and clearly with the DRE, the RE Committee, volunteers, and with the youth and their families to ensure that information pertinent to upcoming programming and scheduling is shared by all parties. The Youth Coordinator will ensure a safe and respectful environment, where youth feel comfortable expressing themselves and interacting with each other. The Youth Coordinator will actively promote Youth Leadership Development by encouraging youth to lead and make decisions whenever possible, but will create activities, delegate duties, and finalize decisions when necessary in order to keep the group healthy and fun. The ideal Youth Coordinator will be at least 25 years of age and will be able to comfortably attend and participate in activities with youth. Driver’s license is a plus. Knowledge of Unitarian Universalism or willingness to learn is a must. Training in pastoral care with youth and/or Youth Advisor training will be available to the Youth Coordinator. OWL training will be available to the Youth Coordinator. In order to work with children and youth in our congregation, candidates must agree to a background check (CORI).